of the most frequent reminders of this is found in our kitchen drawers. I've collected are hardware store clothespins used to fasten bags. 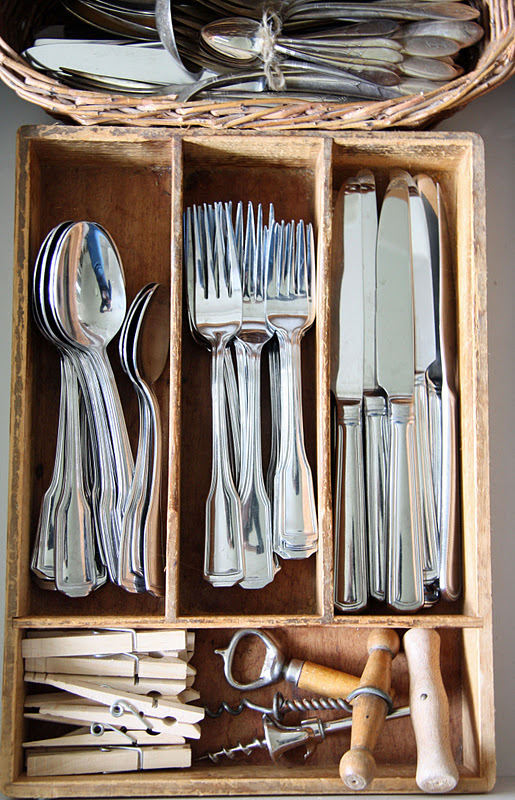 The wood cutlery box was my Grandmothers. This old wicker paper basket holds our knives and some of our serving utensils. The other kitchen drawer holds mostly new utensils with a few old things mixed in. was found at an antique store. and peeler. I love the mix between the cool metals and the warmth of the wood and wicker. used, yet how compatible they are today. only baby spoons we use so they're used several times a day. 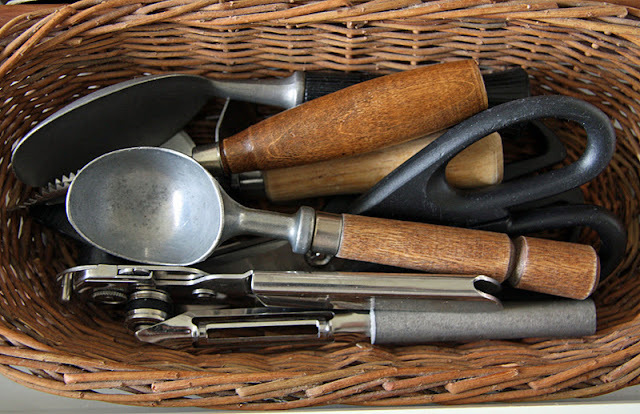 A peek inside your kitchen drawers ... what an interesting post! We use wooden clothes pins for securing bags of chips and pretzels too. I love the way you display your tools in whicker baskets and old wooden trays! Thanks for sharing! I love this type post...seeing the inside of drawers. Yours are so neat! Once little hands start digging that neatness will disappear and you won't even mind! :) The baby spoons are so special. I am saving a couple myself for the "one day" grandchild. Wish I could keep my drawers that organized. I also have old mixed with new. I like the use of the baskets. I would of never thought of that.It is a great idea. You have inspired me to look for low baskets to fit in my drawers to hold things more neatly! Such beautiful drawer organization! Wow! Your pictures make the ordinary look SPECTACULAR! 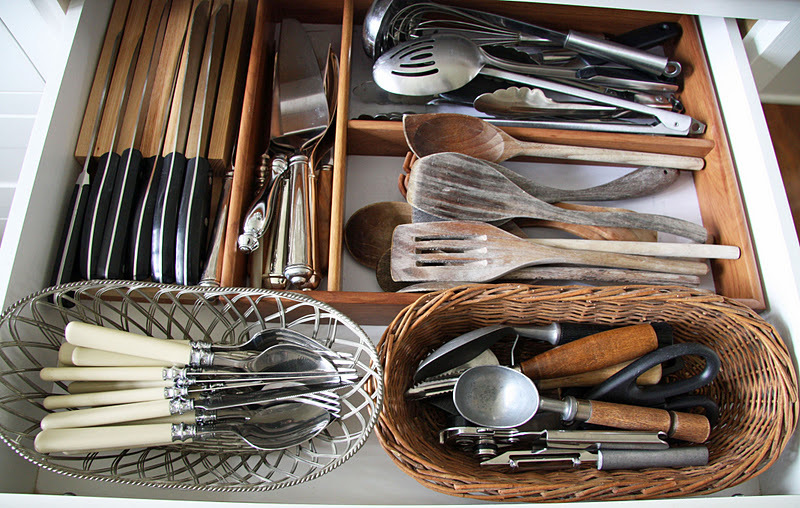 I love the way you've got things organized inside the kitchen drawers. They are more than functional--but pretty to look at when you pull them open. 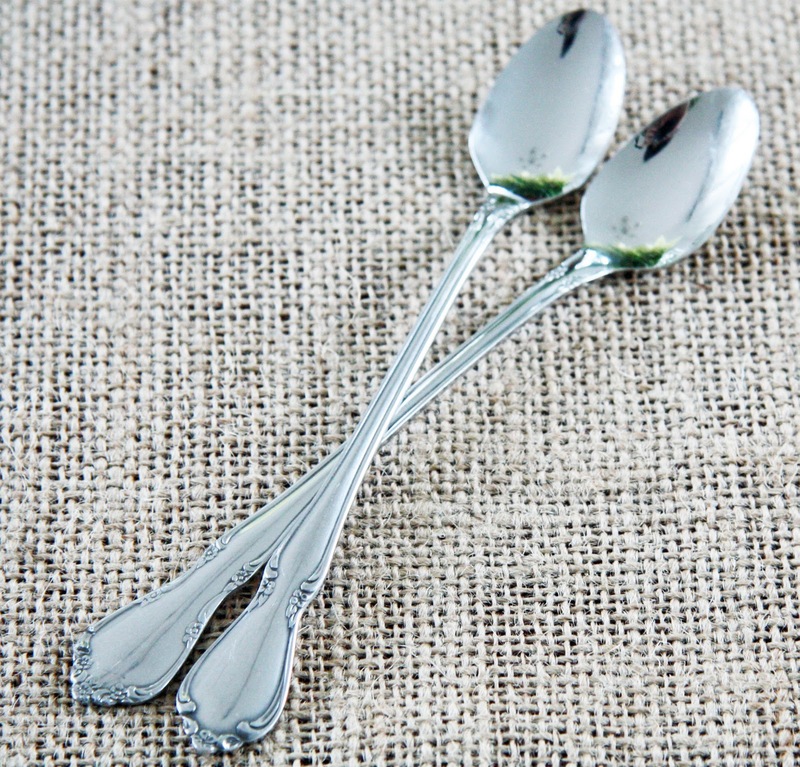 You baby spoons are the same pattern as my mother's everyday silverware. I so wish I had taken it when we cleaned out the house. I think it went to my niece though, so it didn't get thrown out. I love all of your old and new mixed together! Oh these drawers makes me just so happy looking at them! I adore the mix of new and old. Beautiful! I love this post! 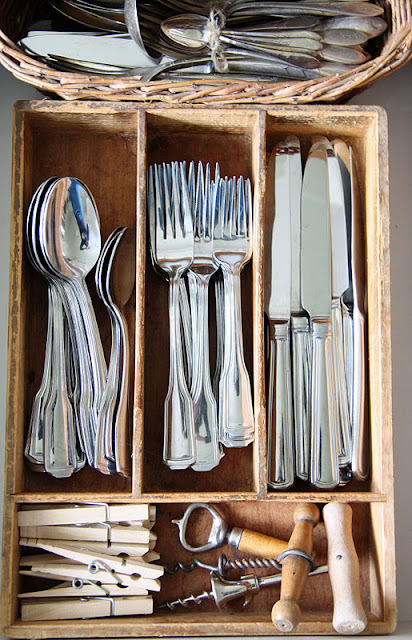 Such a simple thing - storing silverware - but you've done it with such class! I'm going to put clothespins in my kitchen drawer - that's the answer to those awful plastic clips that are sold to serve that purpose. Thanks for the inspiration. Now I think I'll try to find baskets and pretty things to store my utensils in, too. I could admire your organization skills . . . but what I "really" admire is the way you not only use your grandmother's things, but the way you obviously treasure them as well. What a true blessing to have these keepsakes, both big and small, to pass on from generation to generation. It's heart warming - even from a distance. You make everything beautiful. I like your everyday pieces as well as the old stuff - can't go wrong with classic! I noticed your Laguiole silver steak knives - they are beautiful. I have two, bought in France! I think it is even more profound what exquisite taste your grandmother had. I would love to hear more about her life, how she developed her amazing taste, did she have lots of money(!) or just wonderful taste, and where she acquired all her lovely things! I have my moms old spoons that I would not part with if my life depended on it. I love anything that has a history, don't you. Like my 1912 Clawfoot tub. I love it and I love knowing that I have a part of history. I love how you have stored your silver and utensils. How pretty! gosh they look like ice tea spoons...which i just found a set 0f 6 at a flea mkt i use em alot they work nice in these deep coffee/tea cups to stir....i never thought of using baskets like you have i love it!! PS: I found your fantastic blog through Little Green Notebook and am so happy that I did! Ohh how I love this style. 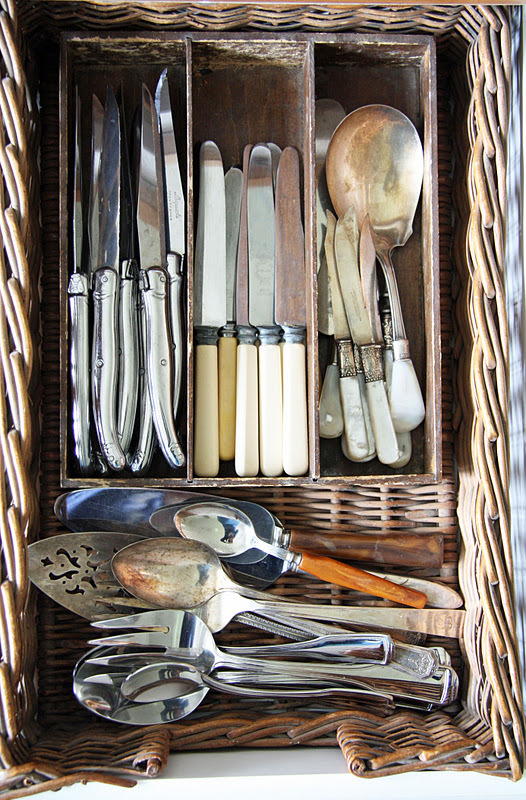 I wouldn't have thought a silverware drawer could be so stylish! Ha. You have a great collection of stuff here :) thanks for sharing! You make the simplest things look lovely. But the thing I love the most is the mix of your grandmothers with your own and your baby spoons. Thank-you so much for sharing your beautiful home with all of us. 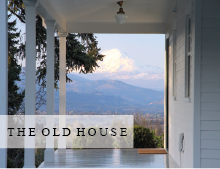 I truly enjoy reading your blog, and your home makes me swoon! Living here in Sydney, Australia we don't really have homes quite like yours but I find your blog very inspirational. My husband and I have renovated a timber cottage and look forward to building a sympathetic extension for it this year. I have always loved your posts but there is something so charming about the old and new in their respective baskets or wood organizer that is so appealing. You tickle my being with smiles . . . taking something each of us look at each day and presenting it to us so beautifully . . .
And I had extra smiles seeing clothes pins which I have used for years for keeping various food bags closed. Works perfectly . . . I loved seeing your spoons which Graham and Margaret are now using. I still have my children's spoons in my cutlery drawers. Warm memories come to mind when I see their spoons . . .
My favourite post of the day . . . I love the mix of old and new, rustic and polished. Your collection looks somewhat like my own, only better organized! I'm glad to find your blog. My goodness! Your organization makes me want to head to my kitchen & get organized! My grandmother hasn't given me her silver yet, but I do have several things (including an ice cream scoop!) from my great grandmother. Those are like works of art! I love what you've done. I'd love to get my hands on some of that cutlery too! Gorgeous. You photographs are lovely and remind me of the things that I have in the kitchen that my mother once used...lovely memories...thank you!! 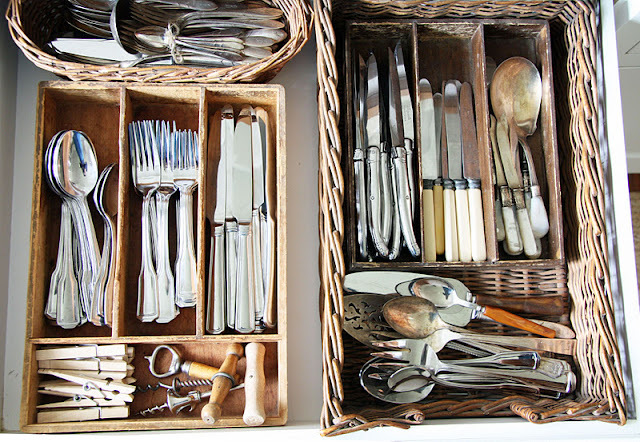 I love how you have mixed the old and new and your grandmothers wooden utensil box is so sweet! I love to collect old silver plate and I have to stop myself from buying more! You made flatware so interesting!! I have some butter knives that I think match the yellow handles ones in the top middle photo. I would get rid of them if you would like to have them. They have E.P.N.S. on the blade. The wicker baskets mixed with wood cutlery holders - very sweet. My favorite thing, however? Your grandmother's ice cream scoops. Love old and new mixed together! Trina, Those baby spoons are precious. Wonderful display - the old and new combined with the the different textures is so pretty. Thanks for sharing! I love such ols things- but my kids? no----- that is work to clean it! I remember seeing the inside of your drawers in Country Living and thinking "Wow, even her drawers are gorgeous!". It's a task on my list of things to do when our kitchen gets it's makeover. This was a fun post, and you are definately organized. The use of baskets and wire holders is a wonderful idea and out of the normal 'drawer' style. Bless you as you continue to bless others. How I love lovely silverware and gadgets. Your baskets are just perfect. I do love the prettiness of them. I have the same white handled silverware. Mine was on sale a t TJ Maxx. Knew it was for me after 3x of looking at it pondering one 3 seperate occasions! Love your mix of old and new. I remember loving this part of the Country Living article, too. It is causing me to rethink my kitchen drawers. Perhaps I could change up a few things! I use wood clothes pins as you do. That is what we did growing up. 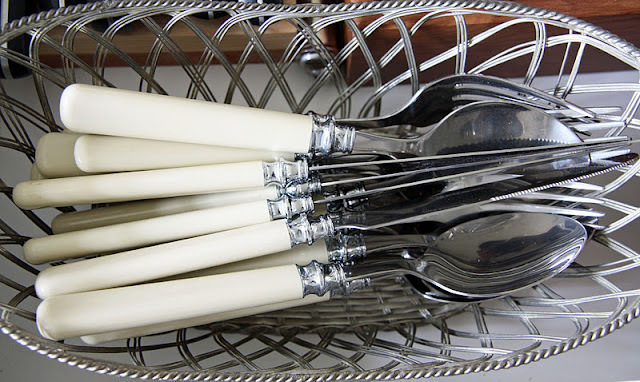 I love your white handled silverware. I have a set of white mugs that I have had forever from the MS Kmart collection, years ago. They are still favorites. I enjoy your posts very much. So beautiful! The pieces themselves, as well as your fabulous photos! The fact that you only use those two fancy spoons with your babes is inspiring me...do you hand wash them multiple times a day?? The baby spoons look like my mother's silverplate. The name of the pattern was "Remembrance" by 1947 Rogers Bros. I do wash them by hand when they aren't already clean. But they do eat finger foods as well so I don't have to hand wash more than once a day. And when I feed them, they share a spoon so that helps! Such beautiful images of such an ordinary item. Really well done! Lovely. I, too, feel connected to others by the mix of old and new. My grandson, who is 5, knows who is represented in the drawer and will comment...I am going to use your mama's spoon, which I love hearing. Often he'll say tell me a story about when you were little. Soon enough his world will be outside of us and later, after he is grown, he'll remember the stories and feel connected to something larger. This is just beautiful. I'm running to the thrift store today to hunt for cool, kind a flat baskets to put in my drawers! So organized, I won't have to hunt for the cheese slicer again. Unless some uninspired family member puts the dishes away for me....nah. Thank you! Beautiful post. I am inspired! I have decided to start collecting old cutlery. I love the ones with the old patterns that are worn. Also love your use of old baskets! Great photos! i think i am addicted to spoons! I love all your utensils. It's amazing how something so simple can bring so much pleasure. Beautiful just to open up the silverware drawer! Wonderful your drawer with old cutlery. It's amazing how you made interesting photos with ordinary things :-) - I love it! Not only do I love everything old and new that you have in your drawers, but I love how you have it all arranged in baskets...wicker, wood, wire...it's so beautiful...I love how you have your grandmothers ice cream scoop. Your collection of old and new is so beautiful. You truly have a special way of photographing everyday items, making them beautiful. Flash back when I saw the baby spoons and now I want to ask my mom if she still has mine. They look exact. I think she got her set from the Betty Crocker book over 40 years ago and she still has the full set in her kitchen. old and new. perfect post. i really need to have that icecream scooper in my kitchen one day! We love the antique pieces from your Grandmother! The pieces we've collected from our Grandparents are the most special to us. Love seeing all this! How brave of you to post on kitchen drawer content--with pictures!! It shows how truly organized you are and reveals an undeniable attention to detail. Lovely!! So sweet. I smiled as I saw the pieces from your grandmother. Mine passed away in July and while I was fortunate to receive so many things from her home, one of my favorite things that now sits in my kitchen are her mixing bowls. Something about using what was hers, that she used every day to prepare meals for her family, brings me so much joy.